About this object A 23 term Member from Illinois, Joe Cannon earned the nickname Czar Cannon during his four terms as Speaker. Republican infighting disrupted the 61st Congress (1909–1911), as Speaker Joseph Cannon of Illinois made only limited committee appointments until President William Howard Taft’s priority tariff bill passed. Cannon then made the bulk of committee assignments depending on how Members voted on the tariff. A coalition of insurgent Republicans and Democrats formed to break Cannon’s power by removing the Speaker from the Rules Committee and shifting the power to make committee assignments. 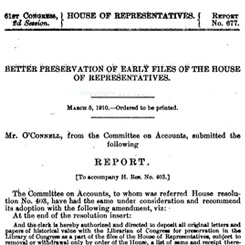 Despite the House conflict, Congress passed the 16th Amendment authorizing an income tax. Other progressive legislation regulated campaign financing and the transportation and communications industries. The House of Representatives “stayed up all night” during a marathon session lasting 29 hours, debating the power of the Committee on Rules. 1For this period, there is no official record in the minutes of the Democratic Caucus or elsewhere of the name of the Democratic Whip. 2Caucus records are contradictory for this period. They show the election of Representative James Hay as chairman on January 19, 1911, but do not mention a resignation by incumbent chairman Clayton, nor do they specify that Hay was elected chairman for the new Congress. Later, they show the election of Representative Burleson on April 11, 1911. 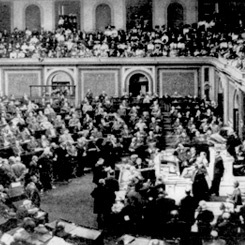 3Resigned March 3, 1911, to become Member of the 62nd Congress. See, Washington Post, March 3, 1911: 4.